My So-Called Life on DVD. That is love, friend. 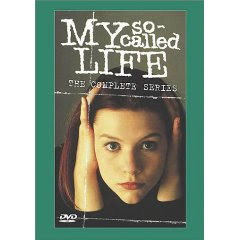 My So-Called Life originally aired 1994 to 1995, and was only nineteen episodes long. Claire Danes played Angela Chase, a fifteen year old sophomore trying to figure out who she was. This is classic coming-of-age drama, with Angela balancing the expectations of family and new and old friends. The clothes and music may be dated, but everything else is fresh and current. While many critics loved this show, others dismissed it. Too white. Too middle class. Too high school. I LOVED this show. Danes perfectly captured a teenage girl at the crossroads: between child and adult. Discovering and trying to figure out sexual attraction, lust and love. Wanting something new and different, as represented by new friends Rayanne and Rickie. Not knowing how to leave behind childhood and childhood friends easily -- hence her dumping of Sharon, who is too plain vanilla compared to Rayanne and Rickie. Loving cool unattainable Jordan, ignoring next door neighbor Brian. And Jordan Catalano. The gorgeous object of Angela's affections. Who did not cheer when Angela eventually kissed Jordan? Yet at the same time... Jordan always stayed what he was. A stoner; someone more interested in cars and music; someone -- let us be honest -- not as smart as Angela. Watching this the first time around, and every time since, I loved that Jordan was allowed to be a whole real person, flawed, and was never turned into the "but secretly he's a deep poet" bad boy. That was the genius of My So-Called Life: while apparently about Angela's so called life, it was actually about each character's own life. Each person was nuanced, with depth, with their own dreams, heartaches, and joys. Rickie and Delia's dance? Rayanne's sexed up version of the theme from Sesame Street? Even the parents were allowed to be whole people. Little things happened or didn't happen that made this show one whole rather than a series of episodes. The same clothes being worn. Sayings such as "In My Humble Opinion" starting with Patty, Angela's mother, and soon spreading to all of Angela's crowd. And, of course, Tito. On the one hand, I'm almost glad it was just a season long, a season in the life of Angela Chase. It was, in a way, perfect, a perfect portrayal in the year of one girl's life. On the other, because this was about so much more than Angela, I wish it had been longer. For those who must: there were two book tie ins, one covering the time period of the show (My So-Called Life ) and one the summer after the series ended (My So-Called Life Goes On ). Here is what is probably the most perfect scene from the show, and I don't care about the spoilers. Why this is perfect: everyone in Angela's high school life is there, in the hallway. Jordan, who is making out with Angela but refuses to acknowledge her in public glances across the hallway at her. Next to him, his friend who thinks Angela is weird. Rayanne and Rickie and Sharon, looking on, as is Brian. And Angela, looking at Jordan, wanting him but knowing its not a healthy relationship. And then... Jordan walks up to her. From one clique to the other, ignoring the stares. Talks to her; takes her hand; Sharon, befuddled because Jordan is the bad boy, Rayanne and Rickie practically cheering, Brian, desolate. And its all conveyed in a few short minutes. My So-Called Life is part of the Zwick/Herskovitz family of TV shows. Which in my head I call Teensomething (this show), Twentysomething (Relativity), Thirtysomething (hey, you call it that too!) and Fortysomething (Once and Again). In considering what shows to highlight, I gave brief thought to both Party of Five and Felicity . Party of Five failed to make the cut in part because it didn't sustain its early promise. The first two season I can watch over and over; after that, it floundered, especially in the portrayal of Julia. Sometimes, the "one season" show is actually a gift to a viewer because you don't have to see such "now she's married! not going to school! she loves Justin! she loves roommates boyfriend! she loves professor! she loves girls! she's a writer!" storytelling. And Felicity...ah Felicity. Loved that show; loved her character growth. Loved that we got to see a grown up Brian Krakow (and yep I think Angela may have dated the older, improved, taller, better hair cut Brian.) Loved it ended up being four years at college. But this suffered a bit of a sophomore slump, pulling in odd problems (I cannot get worked up about gambling storylines, sorry) that sometimes seemed like filler. Plus the time travel wtfery the last season still confuses the hell out of me. Still, I own all episodes on DVD. Loved So Called Life... Loved Felicity... Loved Dawson's Creek. I loved the episodes of this show I saw so much that I'm actually afraid to watch them all. (I'm weird like that, but if there are some I haven't seen then... the show's not over, right?) I agree that the one season is almost perfect -- and then, it's just NOT ENOUGH. I'm a big Herskovitz/Zwick fan, too, but I've never seen any of RELATIVITY. I did watch the other twentysomething (QUARTERLIFE) on the internet a couple years ago, though. What is the difference in the two versions? I wasn't aware of it. One of my favorite shows ever as well - as well as Felicity. I don't have that on tape though, and haven't thought about it for a while. Now I feel like watching it again. I loved this one as well - I've seen every episode so many times, although I don't have it on DVD. This particular scene is so perfect; it's what made me think Jordan was worthy of Angela, that he might get it together that even though he was all the things you mention, he had promise. He had guts. He was just so freaking cool - and the only cool guy ever to actually use his cool for good and date the great girl!!! ha! Mollie, I just checked my shelves and I also have a solo DVD of three eps. I must have bought it when they sold solo DVDs of eps before realizing box sets was the way to go. Jeanne, oh I'd love to rewatch that! I think that was one that had music rights issues. Not sure. Does the music sound different? tanita, as I'm watching series on DVDs I definately get to the point where I want to drag it out so it doesn't end. Elissa, I really liked Relativity. It had Kimberly Williams and oh the rest of the cast! Jim from GHOST WHISPERER, and the boss from HOUSE, and Poppy Montgomery, and the actor who played Brian Krakow. QUARTERLIFE is the one I haven't watched at all. MR, the second set has to die for extras. Both extras on the discs, but also print extras with details like how a year passed between shooting the pilot and the rest of the season. Which you can kinda tell from Claire Danes height. Colleen, remember his song Red? Which turned out to be about his car? I'd love to know where they would have gone with his character, to keep him Jordan without turning him into Jesse from Gilmore Girls. Oh, My So Called Life. Love that show. I only missed one episode. Will have to catch it on the DVD. Thanks, Liz. I just added the series to my Netflix queue. I have heard much about this series but missed it when it was on the first time. Thanks for the rec! Oh I love this show. Remember when they aired the whole series, marathon style, on MTV? I made my dad record it, and then my friends and I watched those tapes until you could barely recognize the characters on the screen. Also, by the millionth time around we had all succumbed, at least once, to the advertisements for the crappy hair dye that sponsored marathon. I Loved this series! Felicity and Party of Five as well, but this one holds a special place in my heart. It was on during my Junior year in high school and I was in so many ways just like Angela. Destined to never be with a boy who didn't end up being gay, always hanging with the theater and band geeks. Just out there. I loved having a show that was so perfect in it's portrayal of a typical high school girl, not the inflated Gossip Girls of today (not that those don't have there place, but you know). Just perfect! Great choice and great write up! In fact, I was one of the die-hard fans who promised to buy the complete DVD series if they produced it. No one was releasing full series back then, so they said they would only do it if a certain number of fans crossed their hearts and promised to buy it. I crossed my heart, so I got the limited edition MSCL set...which came in an MSCL lunchbox!!! Jay - I once followed an ebay auction of one of those lunchboxes that was over $250 when I gave up hope. For just the lunchbox. lawral, i really like the extras with the later set. they are real and substantive. 1stdaughter, i've begun watching FRIDAY NIGHT LIGHTS and i think that is pretty good high school -- not glammed like gossip girl. i've been pretty impressed so far. Oh, My So-Called Life! I think that hallway scene might be my favorite TV moment of all time. Perfection. Loved MSCL. It's like Buffy in it's influence, even for such a short-lived show. Like when you are looking at old photos and your friend says "Who's that?" and you say, "He was my Jordan Catalano" and she totally understands what that means. Sigh. Mr Lush got me the new boxset for Christmas when it came out because I was too poor to buy the original boxset and then it was impossible to find and I was heartbroken. I should have a MSCL marathon as soon as I dig out a babydoll dress, a cross chocker, some flannel, and my Doc Martins. Liz, the episode I missed is the one where Rayanne and Jordan get together. I am a die-hard MSCL fan. When they released the DVD series set, they had all the episodes releasing one by one each week on ABC.com, and I was SO excited to re-watch them! And I totally agree with your Po5 and Felicity assessments. What is it with JJ Abrams and time travel??? Seriously??? He did the same thing to Alias in the end -- transform an awesome spy show into some strange search for artifacts from a prophetic inventor. At least with Fringe and Lost, he introduced odd elements from the beginning! Where Are You, Mary Sue? Dear America? Why Not Dear World?